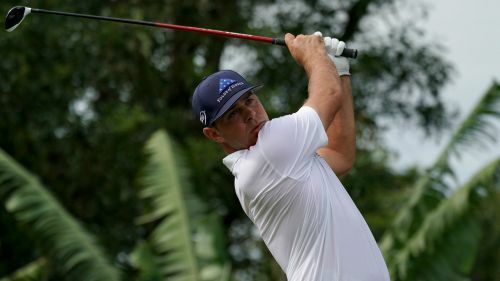 Gary Woodland, Marc Leishman and Shubhankar Sharma have a share of the lead at the CIMB Classic heading into the final round. Englishman Woodland sunk a birdie at the last to make it a three-way tie in Kuala Lumpur, where a host of other players are in contention. Australia's Leishman and Indian golfer Sharma were level atop the summit heading to the 18th hole, where the latter missed a birdie putt for the outright lead. Leishman could only manage par but Woodland – who shared the overnight lead with the Australian – got the gain he needed to stay among the frontrunners. After tying the course record to take a share of the lead on Friday, Woodland had six birdies and a bogey in the penultimate round. Leishman enjoyed a flawless front nine, opening with back-to-back birdies and an eagle from three holes before further gains at the fifth and seventh, while Sharma moved up the leaderboard courtesy of seven birdies on an impressive day. -4 thru 3 to start for @MarcLeish! Louis Oosthuizen (65) and Bronson Burgoon (67) are two shots off the pace, a stroke ahead of Austin Cook (68). Meanwhile, two-time champion Justin Thomas dropped four to be tied for 19th following his three-under-par 69.